The first day of summer or the first day of camp are supposed to be exciting and memorable and calm. But sometimes things don’t work out and it doesn’t go your way or the way you thought it should play out. I get that and I am not an evil, mean Mom waiting to pounce on the first mistake someone makes with my child. So on the first day of camp when the lift bus was late (by an hour) and the lift on the bus was not working, and then no one was trained to use the lift at the pool, I found myself becoming “that Mom.” Angry and disappointed and hurt for my child. Some fast diligence from the folks in charge helped to rectify the situation and by day two everything was in place and all systems were flawless, which I very much appreciated. But the simple fact, is that this is not the only time this has happened. 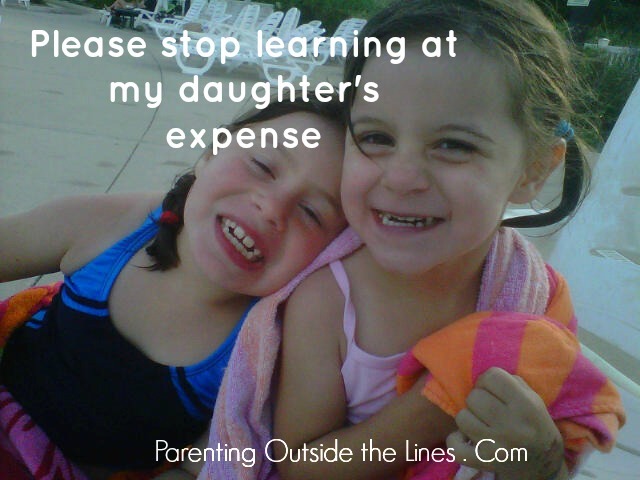 The world seems to have to learn at my child’s expense. The world seems to wait until the actual piece of accessible equipment is needed and try it out in real time, when these systems should have been checked and this equipment should have people trained to use it. Why? Why is my sole child not important enough to have that checked in advance? Because she is one in a sea of many? Because the representation of children with a disability is so much smaller than the masses? When there was a fire alarm at our elementary school and my daughter was on the second floor with her wheelchair, we realized that the system everyone assumed was in place, was actually not. The fire fighters had no idea she was there and that she was number one priority, and there was no system in place to get her down the stairs if she and her aide were in imminent danger. Now thankfully, it was not a huge raging fire and we all could breathe a sigh of relief that we realized the system was not in place and we had time now to have some foresight if this was a real emergency. But as I sit here months later and think about it again, I get chills. Why learn on my child? Why does this have to happen for us to say ” hey, there is danger here in an emergency” and the system does not work. Why has this not been tested and re-tested and had blind runs to make sure every part of this plan and this system is in working order BEFORE my child is on the second floor? Is it my job as the Mom to ask for this to happen. For the bus schedule to be checked, for the lift to be checked to make sure it is in working order, for the pool staff to be trained on how to work the chair lift, for everyone to do their jobs? I don’t want to be responsible for everyone else’s role in my child’s life and to make sure every system is in working order. And I don’t want the rest of the adults in her life to learn by doing. I want pre-planning and accountability, and I want more than anything to be able to trust all of the working parts of her life. This makes me mad and sad. You’re so right – everything needs to be tested and re-tested BEFORE an emergency. I’m glad you’re speaking up and writing about this. Sharing on my FN FB page. I am also 100% sure that the camp was notified ahead of time a lift bus was needed. So DOUBLE SHAME on them that things weren’t tested and right on day one. What if you had to go to work or lose your job?